Treatment for dog cancer of any type, form or in any system primarily focuses on the complete eradication of uncontrolled, persistent & proliferate cellular growth. Surgical operations, chemotherapeutical agents and radiation therapy are the three main options for treating a dog cancer. Canine alternative cancer treatments are available, but cannot be considered a cure and are dependent on how your individual dog reacts. In most cases the goal for dog cancer treatment is the complete removal of cancerous cells remains unachievable due to quick, progressive and diffusible (spreading deep into the tissue) nature of cancerous cells. Owners of a dog should be aware of the nature of cancer, treatment options, prognosis and expectations of a treatment plan prior to proceeding. It is important to consider the impact of treatment on your dog's quality of life, not to mention the expense and time required, and odds of a recovery. Here's a helpful podcast on cancer in pets from the American Veterinary Medical Association. Surgery is considered the most effective dog cancer treatment option. Surgery not only helps in eliminating the cancerous cells, but is also one of most important tools used to diagnose many cancers prior to treatment, like laporatomy in case of dog pancreatic cancer. To form a diagnosis, a sample from the diseased area may be needed for testing. Test types include biopsy, needle excision and incision. Complete surgical removal is indicated when there is a mass of cancerous cellular growth that can be removed. Tumors such as the case of several benign types of tumors which are referred to as being encapsulated, are candidates for a surgical approach. Complete and partial amputation of organs in order to not only remove any cancerous growth, but also to manage severe pain. Pain in many cases may lead to shock, therefore surgical amputation is necessary. Surgical procedures may be indicated along with other options such as chemotherapy and radiation therapy. The application of different approaches to radiation such as X – Rays, Electrons & Gamma Rays are all common options to restrict cancerous cellular growth. In most cases radiation therapy has proven to be effective, but possess severe adverse side effects. Deep and inaccessible cancerous tissues, which are harder to eradicate through surgery may be treated with radiation, such as cancers that are found deep in the chest, abdomen and pelvis. Diffused form of cancer like carcinomas that can only be eradicated through radiation, as in most cases surgical options fail. 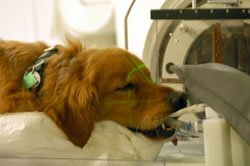 Radiation in combination with surgery are a more effective and reliable way to treat dog cancers. Radiation therapy may cause severe damage to normally growing cellular populations, like those of epithelial (outer layer of the skin) and skin tissues. In many cases the development of secondary cancers are reported due to the high intensity of the radiation application, like in transmissible venereal tumors. The application of intense radiation may result in secondary dog testicular cancer. Radiation therapy may cause acute necrosis (cell death) of various soft and hard tissues. Osteonecrosis (bone cell death), retinal degeneration (eye cell death) & neural necrosis (brain cell death) are some of the examples. Chemotherapeutical agents used to treat dog cancers have different properties, mode of action and degree of response. All of these factors are used to calculate their administration and the potential results. In most cases where surgical options and radiation therapy have proven limited, chemotherapy has emerged as the only option to eradicate cancer despite the potential for severe adverse side effects. Different anti-cancer chemotherapy drugs have been identified for this purpose which include alkylating agents, anti – metabolites, anti–tumor antibiotics and vinca alkaloids. Precise dose calculation and careful handling of various anti-cancer drugs is required. Many anti-cancer drugs like vinca alkaloids can trigger a severe and irreversible cancerous cell division if an inappropriate dose is administered. Similarly several anti-tumor antibiotics have adverse effects on the gastrointestinal tract, causing vomiting, diarrhea & irreversible problems with the intestinal tissues. Use of chemotherapeutical agents in combination has proven effective. Dog owners consult with a veterinary oncologist to calculate the correct dose and supervise the administration of chemotherapeutical agents. Along with the three primary options i.e. surgery, radiation & use of anti cancer drugs, many other options are now in experimental stages to treat dog cancers. These options include genomics & proteomics. Gene therapy & gene replacement are some of the examples, though not practical yet. There is hope that these types of approaches will replace conventional ways to treat canine cancer in the future. In addition, there are constantly clinical trials being conducted that may provide new and helpful information and opportunities at low or no cost. A good source for information is the Veterinary Cancer Society. Any dog cancer treatment plan includes the need to maintain a balanced diet. Malnutrition is being an important factor to avoid. Most veterinarians prefer that dog's stay with a high quality commercial diet, since these contain the correct ratios of needed nutrients. For those considering a homemade diet, such as those found on the internet, be cautious and if you want to go this route, consult with a veterinary nutritionist to make sure you are not missing a key nutrient. Regarding supplements for dog cancer treatment, there has been a significant amount written about anti-oxidants (vitamin c and vitamin 3) and protecting cells, particularly during chemotherapy or radiation therapy. Researchers are not clear if anti-oxidant supplementation works to protect health cells AND cells that are targeted by the treatment to be killed. Discuss the latest research with a veterinary oncologist. The best approach may be to rely on anti-oxidants that have already been added to commercial foods. There are two supplements that can help, yet not interfere with the effectiveness of treatment. These are Omega 3 fish oil and L-arginine (one source is the product Wysong Call of the Wild for Dogs and Cats). Be sure to not use flax seed oil as a substitute for fish oil as its effectiveness has not been proven. If your dog rejects the smell, there are unscented versions available. Purchase products that are formulated for dogs and only provide under the direction of your veterinarian. It is thought that L-arginine lowers cytokines levels in the blood. Cytokines are thought to promote cancer cell growth. Astragalus membranaceous (Huang Qi): research is focused on this herbs ability to support immune system function. Astragalus helps to maintain blood sugar and blood pressure levels within the normal range, support vitality and a healthy appetite and maintain regular water metabolism. Currently, much of the pharmacological research on Astragalus is focused on its immuno-supportive polysaccharides and other active ingredients useful in supporting a healthy immune system. (Wang DC. “Influence of Astragalus membranaceus (AM) polysaccharide FB on immunologic function of human periphery blood lymphocyte”. Zhonghua Zhong Liu Za Zhi 1989;11:180-183). Viscum album (Mistletoe): supports normal blood pressure and to maintain a healthy immune system. Tested in animal studies with many positive findings. One study showed that cellular components of the body’s natural immune system (such as monocytes and granulocytes) bound Viscum album agglutinin-I molecules to a higher degree than lymphocytes, suggesting that this herb can support natural immune responses. (Hajto T, Hostanska K, Fischer J, Saller R. “Immunomodulatory effects of Viscum album agglutinin-I on natural immunity”. Department of Internal Medicine, University Hospital Zürich, Switzerland. PMID: 9179367). Echinacea purpurea: supports immune functioning. Echinacea is a tonic for the lymphatic system. Over 500 scientific studies have been documented on this herb. Specific studies have investigated the immune-supportive action of Echinacea ( Barrett BP, Brown RL, Locken K, et al. “Treatment of the common cold with unrefined Echinacea: a randomized, double-blind, placebo-controlled trial”. Ann Intern Med 2002;Dec 17, 137(12):939-946). Sylibum marianus (Milk Thistle) is regarded as one of the most important herbal liver tonics and restoratives, and therapeutic use of Milk Thistle may be traced back more than 2000 years. Many clinical trials which clearly demonstrate its effectiveness. Scientific analysis of Milk Thistle shows that it contains a flavonoid complex called silymarin, which is largely responsible for the therapeutic benefits of this herb. Silymarin is a powerful anti-oxidant and its positive effect on maintaining healthy liver functioning would have a direct impact on the overall systemic health of your pet as the liver is one of the most important organs in the body. (Pares A, Planas R, Torres M, et al. “Effects of silymarin in alcoholic patients with cirrhosis of the liver: results of a controlled, double-blind, randomized and multicenter trial.” J Hepatol 1998;28(4):615-621. )( Benda L, Dittrich H, Ferenzi P, et al.”The influence of therapy with silymarin on the survival rate of patients with liver cirrhosis (author's transl)”. Wien Klin Wochenschr 1980;92(19):678-683.) Milk Thistle is also regarded as a potent antioxidant. Again, consult with your veterinarian when trying this dog cancer treatment approach. While not a cure, products like C-Caps Formula could be part of an overall treatment plan.